Are my username and password the same as last year? Can I register for more than one Xtreme Hike? What if I want to register as a member of a team, but I don't see my team listed? How long is Xtreme Hike? What happens if it rains on hike day? Will there be food and beverages available at Xtreme Hike? Is payment required to participate in Xtreme Hike? Can my child participate in Xtreme Hike? What is a "virtual hiker?" If I can no longer hike at the event, can I still participate in Xtreme Hike? How can I get a dri-wick shirt at Xtreme Hike? If you participated last year, your username and password will be the same. Since we have switched to a new web platform in 2013, your username and password from any year prior to 2013 is no longer valid. Please refer to the Event Registration document for detailed instructions on how to register. You can reset your username and password at any time. Hover over the login button, and click on the link that says “Need Help?” Then, follow the prompts. Yes! Click on the “Find a Hike” button and select the Xtreme Hike event you’d like to register for. Contact the Xtreme Hike staff contact listed on the event home page to gain information on how to register. When you log into the Xtreme Hike site you will see a “My Events” button at the top, right-hand side of the screen. Click this button to visit the "Participant Center" of each event for which you registered. There is a registration donation and recommended minimum pledge for each event. What if I want to register as a member of a team, but I don’t see my team listed? The event is three days, but the actual hike is one day through some of the most scenic trails in the nation. Please contact your local chapter for more information on the distances of the Xtreme Hike in your area. Xtreme Hike will continue to take place as planned, even if it rains. We encourage you to come prepared for any inclement weather. However, in the event of severe weather, CF Foundation staff may postpone or cancel an event. Will there be food and beverages at Xtreme Hike? All Xtreme Hike events offer meals throughout the weekend with plenty of water, sports drinks, energy bars and other salty and sweet snacks on the trail during the hike. Contact your local chapter for more specific information on the food and beverages offered at Xtreme Hike. There is a suggested registration donation of $100 as well as a suggested fundraising amount. Children under the age of 18 are not permitted to participate in Xtreme Hike. However, we welcome their support as an Xtreme Hike volunteer. For more information about becoming an event volunteer please go to your event home page and click on the “Become a Volunteer” button. Safety on the trail for the day of the Xtreme Hike Event is the CF Foundation’s number one concern. Please help us maintain a safe environment for all registered participants. • Xtreme Hike participants must be registered and be at least 18 years of age. • Restrictions may be imposed by the trail authorities on the number of event participants allowed on the trail on the day of the hike (including our hikers, volunteers and staff). Fees could be assessed against the CF Foundation for exceeding the number of event participants, volunteers and staff allowed. 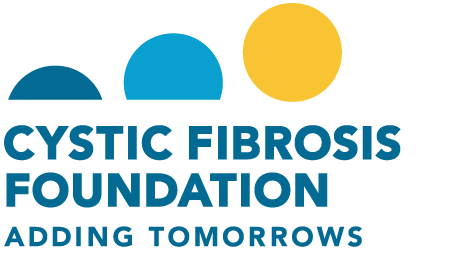 • Please note that the CF Foundation has the right to ask any participant to leave the event at any time if this policy or other CF Foundation policies is not followed. Your local chapter contact is happy to answer any questions you may have regarding this policy. Registering as a virtual hiker is a great option for anyone who cannot participate on hike day but still wants to be part of their local Xtreme Hike. All virtual hikers will receive access to the "Participant Center" to help them raise funds for Xtreme Hike, and can still qualify to receive the Xtreme Hike dri-wick t-shirt and to become a top hiker. If you are no longer able to hike, you can absolutely still be a part of Xtreme Hike either as a volunteer or a virtual hiker. For more information about becoming an event volunteer, please go to your event home page and click on the “Become a Volunteer” button. Each hiker who reaches the suggested fundraising minimum will receive a dri-wick event t-shirt at the hike. 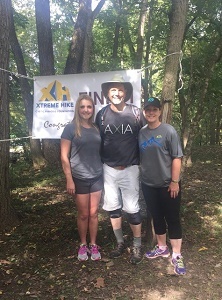 Dana Trokey shares her story about becoming involved with Xtreme Hike and how she draws inspiration her daughter, Isabelle, who lives with CF. Search for a hiker or team to make a donation, or make a general donation.